While restaurant operators are preoccupied with trying to figure out how to grow business in a flat environment, movie theaters, bowling alleys and other recreational outlets are expanding the variety and quality of their food — and stealing restaurant customers in the process. According to the latest data from The NPD Group Supply Track, which tracks products shipped from leading foodservice distributors to each of their operators, in the year ended June 2016, total broadline sales moving through participating distributors grew to nearly $91 billion dollars, an increase of just over 1 percent. While eating and drinking establishments contributed 53 percent of the overall sales growth, recreation posted the highest percentage increase. The fastest-growing operator segments within recreation include movie theaters, amusement parks, cruise lines and bowling alleys. Movie theaters in particular have increased foodservice spending 20 percent compared with a year ago, according to the SupplyTrack data. It’s no longer just popcorn, pizza and pretzel bites ordered from the concession counter: Many major movie-theater chains now offer full chef-driven menus complete with alcoholic beverages and seat-side service. The largest food categories being purchased by movie theaters include chicken, frozen fries, cheese, bacon, ground beef patties and carbonated soft drinks, which all posted double-digit gains in the year ended June 2016. Among the fastest-growing food and ingredients at movie theaters are biscuits, tortillas, breakfast sandwiches, stuffed chicken breast and jams/jellies/spread. Consumers have also increased their foodservice visits to movie theaters. According to NPD data, foodservice visits to U.S. movie theaters have increased 8 percent in the year ended June 2016, compared with the same period year ago. 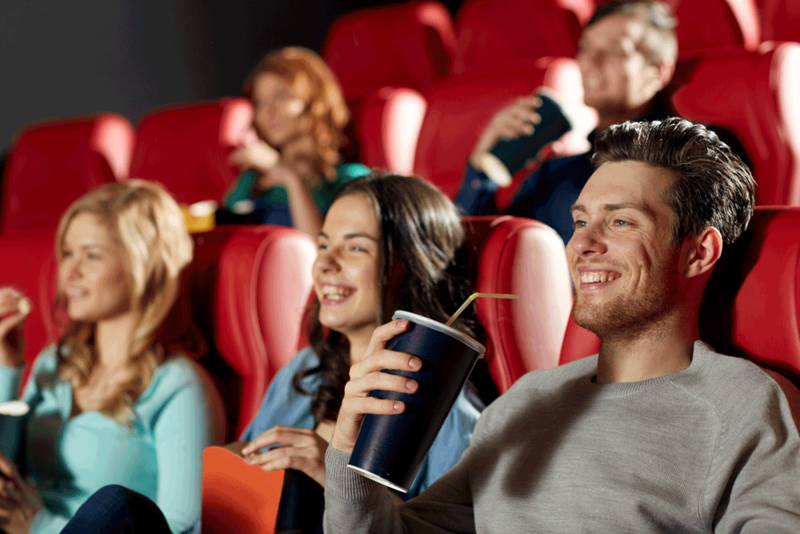 Additionally, NPD’s most recent Eating Patterns in America report reveals that consumers are spending less on products and more on experiences, a shift that may be contributing to more consumers choosing to visit movie theaters with restaurant-like food. Executives at AMC Theatres and Movie Tavern, two companies that have been offering dine-in movie-going for sometime now, share how they are using restaurant-quality food and beverages to create unique experiences that keep guests coming back. In 2008, Leawood, Kan.-based AMC Theatres opened two movie theaters with dine-in options. The company now has 19 Dine-In Theatres that offer chef-inspired menus with seat-side or delivery service. With full restaurant offerings, these locations are designed to offer dinner and a movie in a single experience. According to the company’s most recent financial filings, Dine-In Theatres represent 5 percent of the AMC’s total theaters, and generate 11 percent of its circuit-wide food and beverage revenue. “Food has become an important part of the [movie-going] experience,” said Jennifer Douglass, AMC vice president of dine-in operations. Taking inspiration from the restaurant industry, the Dine-in Theatre menu includes a wide variety of casual and fast-casual-like fare, such as The Royal, a beef burger topped with bacon, Brie cheese, caramelized onions, baby arugula, sweet fig jam and housemade royal sauce (a mayonnaise-based blend with fresh herbs and spices, sweet pickle relish, soy sauce, Worcestershire sauce, savory mushroom powder, garlic, cracked black pepper and kosher salt); Southern-Style Chicken Tenders, made with hand-battered chicken tenders with ranch and honey-Dijon dipping sauces; and a Chicken Quinoa Bowl, with grilled chicken, rainbow quinoa, roasted asparagus, tomato, toasted almonds, feta cheese, lemon vinaigrette and fresh basil. “We view our theaters as places that are over the top, and we want the food to be the same way,” Douglass said. Founded in 2001, Dallas-based Movie Tavern is a self-proclaimed “cinema eatery” that has 24 locations in 10 states offering chef-driven menus with premium food and drink delivered seat-side. The menu at Movie Tavern is focused on tavern favorites like burgers made with 7 ounces of freshly ground beef on a brioche bun, made-to-order chicken tenders, flatbread pizzas and fried artichoke hearts. To create craveable offerings that are easy to eat in the dark, the chain draws on a culinary team made up of chefs and movie theater experts, as well as partnerships with broadline distributors and national food brands. Like many restaurant chains, Movie Tavern tries to inspire repeat visits with a loyalty program. The chain’s free membership comes with benefits such as complimentary popcorn upon signing up, a free movie ticket for each member’s birthday, and free invitations to special events and advance screenings.